Namit Arora at Shunya's Notes describes his journey through Dholavira, the remains of a 5000 years old metropolis in the Rann of Kutch, an environmentally inhospitable region in western India. Excavation has uncovered a sophisticated urban development whose inhabitants, it is clear, were very much obsessed with channeling and preserving fresh water within their city. That precious commodity of human survival and civilization is in short supply in the desert region of the Rann of Kutch. Namit found an ancient bangle among the ruins. Did he keep it? He doesn't say. The road to Dholavira goes through a dazzling white landscape of salty mudflats. It is close to noon in early April and the mercury is already past 100F. The desert monotones are interrupted only by the striking attire worn by the women of the nomadic and semi-nomadic pastoral tribes that still inhabit this land: Ahir, Rabari, Jat, Meghwal, and others. When I ask the driver of my hired car to stop for a photo, they receive me with curious stares, hoots, and giggles. This is the Rann of Kutch, an area about the size of Kuwait, almost entirely within Gujarat and along the border with Pakistan. 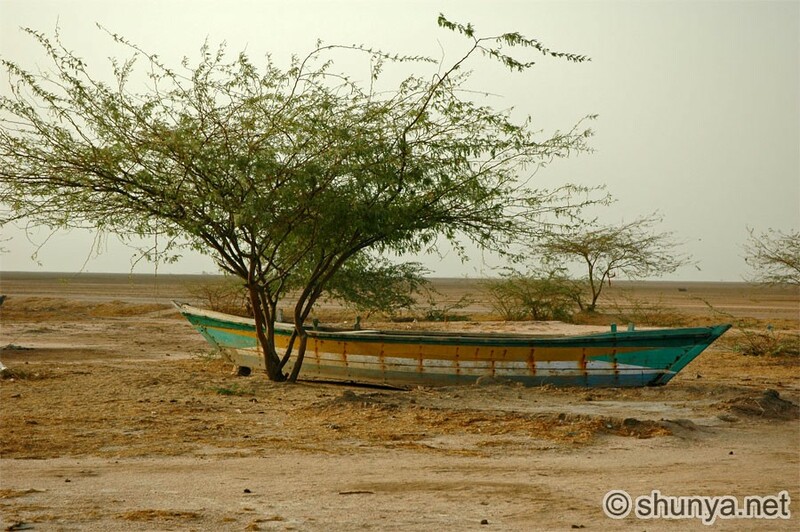 Once an extension of the Arabian Sea, the Rann ("salt marsh") has been closed off by centuries of silting. During the monsoons, parts of the Rann fill up with seasonal brackish water, enough for many locals to even harvest shrimp in it. Some abandon their boats on the drying mudflats, presenting a surreal scene for the dry season visitor. Heat mirages abound. Settlement is limited to a few "island" plateaus, one of which, Khadir, hosts the remains of the ancient city of Dholavira, discovered in 1967 and excavated only since 1989. Entering Khadir, we pass a village and find the only tourist bungalow in town. It hasn't seen a visitor in three days; I check in and head over to the ruins. I've planned this for months; even the hottest hour of the day cannot temper my excitement for the ruins of this 5,000 year-old metropolis of the Indus Valley Civilization. While hundreds of sites have been identified in Gujarat alone, this is among the five biggest known to us in the entire subcontinent, alongside Harappa, Mohanjo-daro, and Ganeriwala in Pakistan, and Rakhigarhi in India. Thanks for highlighting this here, Ruchira. My pleasure. Yours is actually the best first hand report I have read on Dholavira. The other article was a few years back in a Bengali periodical. But that was set more in the context of the Aryan Invasion (did it happen?) and the Saraswati-Vedic civilization debate which seems to have gained currency in the context of Indian archaeology. The accompanying photos in your article are much better too. What puzzles me a great deal about the Indus Valley civilization in particular and the Indian civilization in general is what happened to those early architecturally inclined people, the urban planners? Where did they go? Even if they were displaced by the nomadic Aryan invaders and pushed toward the south of the Indian subcontinent, why didn't they build similar brick, terra-cotta structures and cities with paved roads and drainage systems elsewhere? And what about the later inhabitants? Why didn't they emulate Mohenjo Daro, Harappa and Dholavira? In a country like India which we know was continuously inhabited and several references to stable urban centers are made in the myths and literature, why is there scant evidence of more lasting edifices deeper into the land - in the east, the middle and the south dating back to three thousand years or so? Where is Indraprastha of the Mahabharat? Were the latter day Indians building structures out of less durable material like wood (or living in elaborate tents) instead of bricks and stone? And why are modern India's rural areas still devoid of the sophisticated water and sewage system that the ancients had the sense to design? If the people moved out of Dholavira and other similar sites because of some catastrophic event, they would have been hard put to survive without their infrastructure. Some may have become attached to other wandering tribes without the necessary technological knowhow, while those who did have the knowhow may have perished.I suspect something similar to the fate of civilizations described in Jared Diamond's book 'Collapse' may have happened to those ancients who created Dholavira.